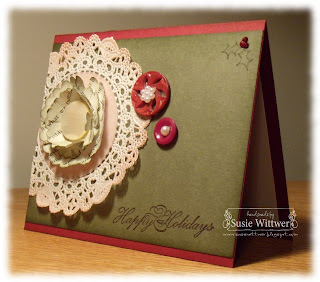 I didn't use any of the vintage lace on this card, but I did use vintage buttons. 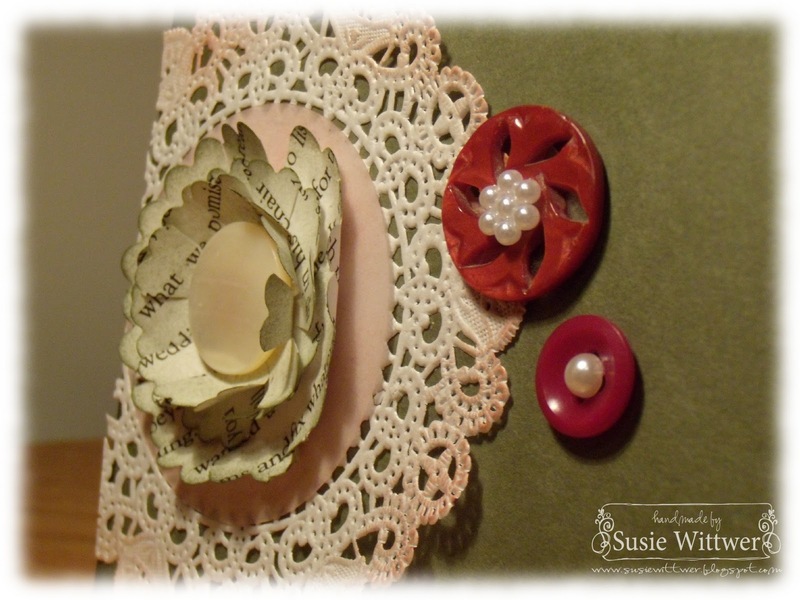 On the two red buttons I added a couple of pearl embellishments. Those buttons just looked a little bare without them...and believe me...I pulled a lot of buttons out of my button jars, before deciding on these 3. I love to attend estate auctions, and I've managed to pick up some beautiful vintage lace and buttons over the past couple of years. Sometimes it's hard to let go of them (ie: attaching them to a card). But, I'm getting a little better at "letting go" of my treasures. See!!! I am SO pleased with this card and it was such fun to make. 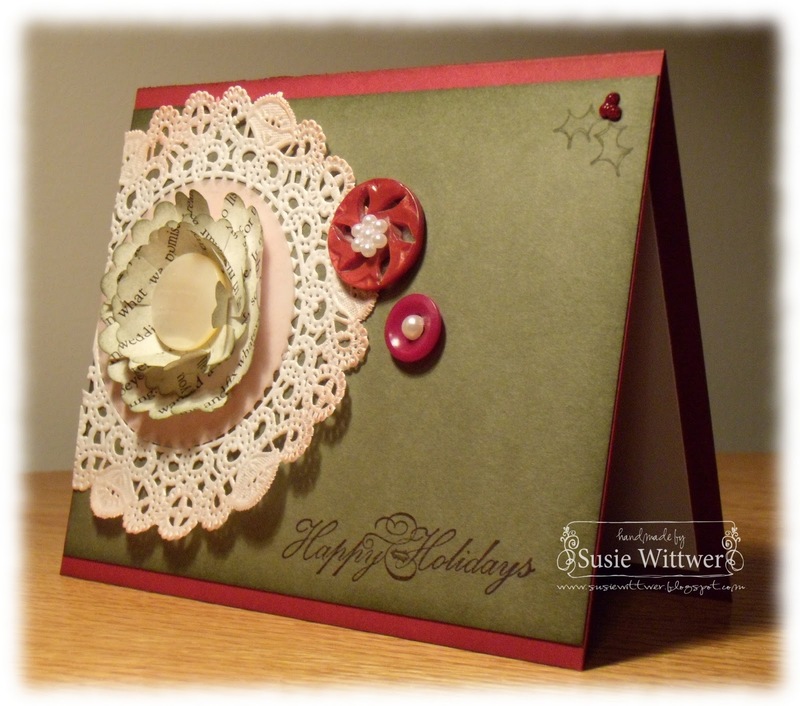 CASE Study #15 ~ I was inspired by the shape of the Heather's card...it reminded me of a doily. Click through to each of these blogs to see all the deets! * Edit* This card is also going into the Crazy 4 Challenges #64 ~ add circles to your project. Okay, enough of my ramblings...here's my vintage-y card! Oh, by the way, under my "book page" flower, I added a piece of vellum. I didn't have the color I needed, so I used white and sponged ink onto it, until I had the look I wanted. I also sponged lightly around the edges of the paper doily. Then a little sponging around the edges of the cardstock...and I had the soft look that I was going for. I hope you like it. Please let me know what you think! Other: printed page from a book (picked up at a garage sale), paper doily (from the cake decorating aisle at HL), 3 vintage buttons, vellum, 2 pearl embellies from my stash...and a few drops of christmas red Stickles. What a beautifully unique card! I love your style Susie! This is really a fabulous take on the colour challenge this week!!! Thanks for playing with the Paper Players! Oh, I absolutely love vintage anything! Your card is marvelous with that precious doily and wonderful hand made flower. Just gorgeous! Thanks for playing along with us at CASE Study challenges! I have a whole package of Always Artichoke that I ordered by accident. I may just have to try out this color combo. This is a very simple take on Vintage and I love that. TFS.